Revista Soc. Mex. Hist. Nat. 11:91, Fig. 1. 1950. TYPE: Mexico. Chiapas: near Cerro Piedra dc Huixtia, 20 km NE ofHuixlla, 900 m elev. Matuda 18615 (MEXU, holotype). 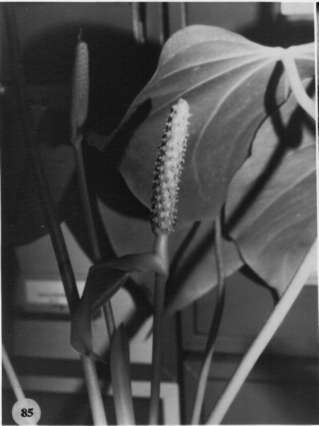 Anthurium bochilense Matuda, Bol. Soc. Bot. Mexico 19: 21. 1956. type. Mexico. Chiapas: Bochil, near San Cristobal de Las Casas, MacDougall 363 (MEXU, holotype). Terrestrial or epiphytic; stems to 14 cm long, 3 cm diam. ; leaf scars 2-3 cm wide, obscured by cataphylls at upper nodes; roots few, ca. 5 mm diam., descending; cataphylls coriaceous, 5-23 cm long, long-acuminate al apex (the acumen apiculate ca. 1-2 mm), drying dark tan (B & K Yellow 5/2.5), persisting intact. 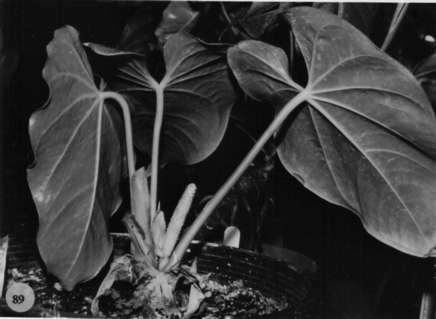 LEAVES erect-spreading; petioles 15-70 cm long, 6-9 mm diam., terete; geniculum 1-5 cm long; blades subcoriaceous, ovate to broadly ovate, 17-70 cm long, 10.5-36 cm wide, broadest just below point of petiole attachment, short-acuminate at apex, deeply lobed at base; anterior lobe 14-50 cm long, the margins rounded; posterior lobes 5-20 cm long, flat to downlurncd, sometimes overlapping; the sinus triangular to hippocrepiform, sometimes ± rhombic in larger leaves when flattened; the upper surface matte to semiglossy with sparse, obscure raphide cells, the lower surface glossy; the midrib sharply raised above, diminished and sunken at apex, convexly raised below; basal veins 5-6 pairs, the third to fifth coalesced 2-2.5 cm, raised; the posterior rib naked, turned up on the outer margin; primary lateral veins 3-5 per side, prominulous above and below, departing midrib at 30°-40° angle, straight or arching near collective vein; lesser veins less conspicuous; collective vein arising from one of the lowermost primary lateral veins or from the first basal vein, flat to weakly raised, 4-10 mm from margin. INFLORESCENCE erect-spreading, shorter than leaves; peduncle 21-39 cm long, 4-7 mm diam., terete; spathe coriaceous, pale whitish-green (B & K Yellow-green 9/10), oblong-lanceolate, 4.5-15 cm long, 2.7-4.5 cm wide, broadest at middle, abruptly long-acuminate at apex, obtuse to rounded al base; the stipe 12 mm long in front, 2.5 mm long in back, pale green; spadix reddish-violet to lavender (B & K Red 8/ 5, red-purple 5/2.5 to purple 6/5), rarely white, 4.2-20 cm long, 6-10 mm diam. at base, 5-6 mm diam. al apex; the flowers 4-lobed, 2.3-3.1 mm long, 2.5-3.5 mm wide, the sides jaggedly sigmoid; 5-8 flowers visible in the principal spiral, 5-9 flowers visible in the alternate spiral; lepals semiglossy, with white inconspicuous punctations, smooth to very minutely papillate, lateral tepals 1.5-2.2 mm wide, the inner margin straight; pistil emergent, white, glossy; stigma 0.3-0.6 mm long, linear; stamens emerging moderately rapidly from the base, lateral stamens emerging to apex before alternates emerge at base, held in light cluster obscuring pistil; anthers white to pale yellow, 0.6-0.7 mm long, 0.6-0.8 mm wide; thecae oblong, scarcely or not at all divaricate; pollen white. INFRUCTESCRNCE spreading to pendent in large plants; spathe de-ciduous; spadix ca. 21 cm long, 2 cm wide; berries orange, globose; seeds green, up to 3 per berry. Figs. 85 and 89. Anthurium huixllense ranges from southern Mexico (Chiapas) to Nicaragua. The species is a typical member of section Calomystrium and can be recognized by its thick, persistent cataphylls that turn reddish-brown and remain intact, and by its relatively long, usually reddish-violet to lavender spadix with early emergent pistils and orange berries. In Flora of Guatemala (Standley & Steyermark, 1958) this species was called A. concinnatum, an unrelated species from high elevations in Costa Rica and Panama. The species is closely related to and is perhaps only subspecifically distinct from A. hoffmannii, which ranges from Costa Rica to Panama. Anthurium hoffmannii has a moderately thick green spathe and a white spadix. In addition, the lepals of A. hoffmannii are generally matte. In A. huixtlense the tepals are glossy and the pistil is rather prominently exserted (although usually soon hidden by the tight cluster of stamens) giving the spadix a coarse, almost "prickly" look. The spadix of A. hoffmannii has the pistils scarcely exserted at or near anthesis so that the spadix does not have a "prickly" look. Spathe and spadix color are quite variable for A. huixtlense. Spathe color may be green to while and spadix color ranges from creamy white to lavender or reddish-violet. For some populations the color remains consistent but since considerable color variation may be found within a population the spadix color is not a useful taxo-nomic character in A. huixtlense. The plants of A. huixtlense with lavender spadices are similar to those of A. armeniense, which has somewhat pinkish spadices and a white spathe. However, that species is distinguished by having the tepals matte rather than glossy and in having an early emergent pistil that is as long or longer than the stamens when they emerge. Another close relative of both A. hoffmannii and A. huixtlense is A. erythrostachyum Croat (ined.) from Panama. The latter species differs from both of the former species by its caudate-acuminate spathe with the acumen up to 3 cm long. It differs also from A. hoffmannii in having the spadix colored somewhat lavender. Anthurium huixtlense has been confused with A. fraternum Schott since the time of Engler. That species occurs in the Sierra Nevada de Santa María of northeastern Colombia. Anthurium huixtlense and A. fraternum share a similar leaf shape (as do most members of the section Calomystrium) and a similar spathe and spadix shape, but A. fraternum differs in having a dense array of discrete, punctiform, glandlike dots on the upper surface of the blade on drying and has a dense array of minute, reddish-brown blotches on the lower surface. Anthurium fraternum is not known from Central America. Belize Cayo:, 1 November 1955, Gentle 8920 (LL). Belize Cayo: 600-720 m, 16.44.42N 88.55.48W, 13 December 1996, Thomas Hawkins 1222 (BRH, MO). Belize Stann Creek:, 18 October 1954, Gentle 8406 (LL). Belize Stann Creek: 246-400 m, 17.03N 88.28W, 8 May 1994, Raœl Rivero, Bruce & Carolyn Miller 2597 (MO, SEL). Belize Toledo: 100-250 m, 16.33N 88.47W, 2-3, 11 Mar 1987, Gerrit Davidse & Alan E. Brant 31893 (MO). Belize Toledo: 80-420 m, 16.32N 88.45W, 5,7,9,12 Mar 1987, Gerrit Davidse & Alan E. Brant 32022 (MO). Belize Toledo: 250 m, 16.29.44N 88.54.47W, 6 May 1996, Gerrit Davidse 35634 (MO, SEL). Belize Toledo: 210-330 m, 16.28.17N 88.55.04W, 13 May 1996, Gerrit Davidse, Martín Meadows & Alan Whittemore 35887 (BRH, MO). Belize Toledo: 950-1000 m, 16.31N 88.57W, 11 May 1996, Bruce K. Holst, S. Matola, G. Sho & C. Kufner 5225 (BRH, CM, MO, SEL). Belize Toledo: 16.29.31N 088.54.37W, 13 May 1997, Gerrit Davidse 36353 (BRH, MO). Belize Toledo: 450 m, 16.27.54N 088.59.26W, 21 May 1997, Gerrit Davidse & D.L. Holland 36664 (BRH, MO). Belize Toledo: 500 m, 16.27.24N 089.01.01W, 28 May 1997, D.L. Holland & Benino Kid 103 . Costa Rica Heredia: Finca La Selva, 100 m,, , Holmes 4211 (IBE). Guatemala : Vera Paz and Chiquimula,, , Watson 258 (GH). Guatemala Alta Verapaz:, 16 May 1964, Contreras 4695 (LL). Guatemala Alta Verapaz:, 13 July 1964, Contreras 5290 (LL). Guatemala Alta Verapaz: 1500 m,, 17 May 1990, Castillo & Hodel 1095 (MO). Guatemala Alta Verapaz: R’o Cobau, 4000 ft.,, 20 Sept. 1920, Johnson 723 (UCLA). Guatemala Huehuetenango: San Juan Ixcoy, 8950 ft.,, 11 dec 1970, Harmon, W. E. 4838A (UMO 99531). Guatemala Izabal:, 11 Feb 1970, Harmon, W. E. & A. Fuentes 1926 (UMO 98135). Guatemala Quezaltenango:, , Skutch 1289 (GH). Honduras : Monkey River,, 5 April 1943, Gentle 4390 (LL). Honduras : 90 ft,, 7 Aug 1934, Yuncker 4955 (NY). Honduras : 1219 m,, 21 Mar. 1995, Simmons, J. 944 (K). Honduras Atl‡ntida: 80-150 m, 15.42N 86.51W, 09 May 1993, Ronald L. Liesner 26091 (MO). Honduras Atl‡ntida: 80-140 m, 15.42N 86.51W, 14 May 1993, Ronald L. Liesner 26323 (MO). Honduras Atl‡ntida: Lancetilla Valley, 10-150 m,, 3 Aug. 1977, Thomas B. Croat 42673 (MO, SAR). Honduras Atl‡ntida:, , Nelson 10741 (TEFH). Honduras Atl‡ntida:, , Nelson 10727 (TEFH). Honduras Atl‡ntida: 900 ft,, 19 July 1938, Yuncker et al. 8584 (NY). Honduras Atl‡ntida: Danto river,, 30 July 1938, Yuncker et al. 8741 (GH, NY). Honduras Atl‡ntida: 620 m, 15.39.30N 86.51.00W, 21 April 1996, Thomas Hawkins 897 . Honduras Comayagua: 610 m, 14.47N 88.00W, 11 May 1991, Davidse 34343 (MO). Honduras Comayagua:, , Zuniga 866 (UNAH). Honduras Comayagua:, , Zuniga 653 (UNAH). Honduras Comayagua:, , Zuniga 793 (UNAH). Honduras CortŽs: Lake Yojoa, 2100 ft,, 30 July 1934, Yuncker 4859 (NY). Honduras Honduras:, , Lancetilla 10495 (UNAH). Honduras Lempira: 800 m,, 8 Mar 1969, Molina R. 24135 (NY). Honduras Olancho: R’o Wampu,, 5 Feb 1982, Blackmore & Heath 1697 (BM). Honduras Olancho:, 4 Feb 1982, Blackmore & Heath 1660 (BM). Honduras Olancho: 1130 m, 14.58N 86.12W, 5 Feb. 1987, Thomas B. Croat & Dylan P. Hannon 64196 (MO). Honduras Olancho: 635 m, 15.25N 85.47W, 7 Feb. 1987, Thomas B. Croat & Dylan P. Hannon 64394 (MO). Honduras Olancho:, , Nelson 10157 (TEFH). Honduras Olancho:, , Nelson 9572 (TEFH). Honduras Olancho: Río del Real, 800 m,, O3 May 1987, Ortega 287 (MO). Honduras Olancho: Río Guayape, 800 m,, 3 May 1986, Espinoza 174 (MO). Honduras Santa B‡rbara: 630 m, 14.53N 88.00W, 02 June 1993, Ronald L. Liesner 26743 (MO). Honduras Santa B‡rbara: 720 m, 14.53N 88.00W, 28 January 1993, Randy Evans 1019 (MO). Honduras Santa B‡rbara: 660 m, 14.53N 88.00W, 2 June 1993, Randy Evans 1784 (MO). Honduras Santa B‡rbara: 600 m,, 23-26 Jul 1976, Vargas 696 (TEFH). Mexico : Mpo. Berriozabal, 1000 m,, 2 Nov. 1971, Breedlove & Smith 21608 (US). Mexico Chiapas: Mpo. La Trinitaria, 1230 m,, 8 Nov 1988, Breedlove & Daniel 71297 (CAS). Mexico Chiapas: Mpo. La trinitaria, 1230 m,, 25 May 1988, Breedlove 68682 (CAS). Mexico Chiapas: Mpo. La Trinitaria, 1230 m,, 15 May 1988, Breedlove & Bourell 67985 (CAS). Mexico Chiapas: Pueblo Nuevo Solisthuacan,, , Croat 74119 (MO). Mexico Chiapas: Mpo. Las Margaritas, 1250 m,, 16 Nov. 1984, Martínez et al. 8617 (MO). Mexico Chiapas: 1000 m,, 9 July 1977, Thomas B. Croat 40583 (MO). Mexico Chiapas:, 21 June 1986, Christenson 1549 (MO). Mexico Chiapas: 1130 m, 17.27N 92.04W, 10 Oct 1986, B. Hammel, E. Martínez & M. Merello 15623 (MO). Mexico Chiapas: 1200 m,, 1 November 1995, A. Perez-Farrera 818 (CR, MO). Mexico Chiapas: 1200 m,, 1 Nov. 1995, Perez Farrera , M.A. 818 (MO). Mexico Chiapas: 1400 m, 16.58N 92.52W, 24 August 1996, Thomas B. Croat 78651 (MO). Mexico Oaxaca: 100 m, 17.10N 94.45W, 19 Jan. 1987, Thomas B. Croat & Dylan P. Hannon 63309 (MO). Mexico Oaxaca: 1860 m,, 23 Ene 1986, Elias Ramirez G. y P. Ramirez C. 111 (MEXU, MO). Mexico Oaxaca:, 22 Ene 1986, Elias Ramirez G. y P. Ramirez C. 26 (MEXU, MO). Mexico Oaxaca:, 18 Jul 1986, Elias Ramirez G. y P. Ramirez C. 351 (MEXU, MO). Mexico Oaxaca: 1500 - 1700 m, 16.44N 094.10W, 1986, Maya 3711 . Mexico Veracruz: 150 m, 17.05N 94.35W, 07 Oct 1986, B. Hammel & M. Merello 15568 (MO). Mexico Veracruz:, , Valdivia 375 (XAL). Mexico Veracruz:, , Valdivia 686 (XAL). Mexico Veracruz:, , Vazquez 51 (XAL). Nicaragua Matagalpa: 900 m, 13.12N 85.42W, 21 diciembre 1982, Pedro P. Moreno 19009 (MO). Nicaragua Río San Juan: 11.07N 084.13W, 16 Febrero 1997, Ricardo Rueda, Indiana Coronado, Oscar Ar‡uz & Franklin Flores 5870 .